Over the past seven years, thousands of people from all walks of life have come to visit our Holy Face Exhibition. 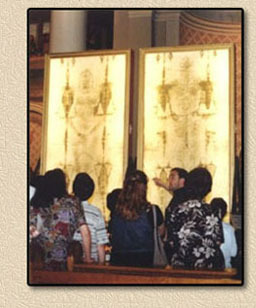 Located in various cities (at different times) across all of North America, the exhibition gives both believers and non-believers an opportunity to see first-hand for themselves, the authenticity and sheer grandeur of the Holy Shroud. It also provides visitors with a deeper understanding and awareness of all the terrible pain and suffering that our Lord endured for all of us.